Destratification destroys or prevents the creation of the density stratification of a water body and thus increases the oxygen supply from the atmosphere. Artificial destra tification aims at reducing algae production and other symptoms of eutrophication (e.g., fish kill, accumulation of hydrogen sulfide). Mixing of P rich deep water with epilimnetic waters increases the P export with the outflow at the surface, so that the mean lake P concentration declines. Scientific background. Destratification may influence the trophic state and the planktonic structure of a lake in a complex way: Algal biomass concentration is expected to be reduced by decreased light availability, by dilution, or by higher abundances of zooplankton. The introduction of carbon dioxide rich bottom water, changes of hydro static pressure, and lower light availability may cause a shift from noxious cyanobacteria to green algae or dia toms. More zooplankters may survive as their mixing throughout the water column makes them less vulnerable to visually feeding fish. Introducing dissolved oxygen to the lake bottom may prevent P release, if the main P release mechanism is due to iron reduction. Destratification, however, also enhances nutrient avail ability in the euphotic zone and therefore phytoplankton biomass has often failed to be reduced or was even increased following circulation. Techniques. Introduction of compressed air through diffusers, perforated pipe, or filters located at depth employs the air lift methods of circulating lakes and reservoirs, in which the water is welled up by a rising plume of air bubbles. Other mixing technologies include (1) pumping oxygen oversaturated water from the surface down to the layer with the highest deficit near the sedi ment, (2) jet stream pumps leading to water displacement, and (3) introduction of warmer surface water to the hypolimnion, inducing a convection flux. The destratifi cation should take place intermittently because some algae species are adapted to permanent circulation. Biomanipulation influences the biological structure within a lake to improve the water quality. 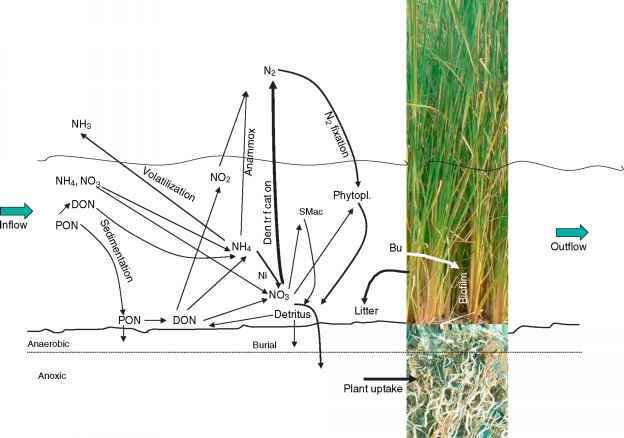 The main applications for lake restoration are the (1) food web manipulation and (2) macrophyte biomass control.